Ashta chandrasana (often referred to as ‘high lunge’) is a posture we’re likely to practice in many dyamic, flow-style classes, and is one that can become familiar and comfortable in a short amount of time when practiced consistently. Once we’ve found balance and comfort in a posture, there’s an opportunity to try variations, and while this twisting variation may look simple, it provides a little extra balancing challenge, and requires a lot more focus….. Twists are a great way to develop more flexibility and ease in the spine and upper back, which is a particularly difficult place in the body to get a large amount of movement into. The thoracic spine is often home to a large amount of muscular tension, due to our posture, day-to-day movement habits, and the fact that a huge amount of stress and anxiety gets stored here. Unlike animals – who literally shake off anger, stress and fear after they’ve dealt with that particular situation – us humans tend to hold onto these feelings and let them bubble away inside us. This is probably something we can all identify with – that part of us that continues to hang on to arguments and stressful situations long after they’ve passed. It doesn’t mean this is a ‘wrong’ thing to do, it’s just something that unnecessarily gets in the way of living in a little more of a peaceful state. The most beneficial thing about this posture, is of course not the physical outcome – it’s the state of mind we’re able to cultivate while we’re in it….. For those few breaths when we’re balancing on a relatively unstable base, looking back behind us and attempting not to fall over (although falling over has just as much to teach us any other part of the practice) we enter into a different state of mind in which the chattering and whirling thoughts become a little quieter, and all that remains is the body and the breath. Using our drishti or ‘focussed gaze’ is an important tool in developing more inward concentration during a yoga practice and cultivating a more meditative state. Where we choose to look when we’re in class can totally change our experience. Letting the eyes wander around the room will only encourage a sense of comparison with others’ practice, and even looking up and down effects how we feel emotionally. (Looking down and hanging the head signals to the body that there’s a reason to look down, shy away or to ‘slump’, while looking slightly up encourages a sense of confidence, positivity and pride). The ability to focus on this one point, (instead of thinking about what we might have for dinner while we’re practicing, or looking at how much more flexible than us everyone else seems to be) is known as eka grata, ‘one pointedness’, ‘close and undisturbed attention’, or ‘a state of determined and continuous concentration’. Being able to focus on just one thing at a time is – as we know – incredibly difficult. In a society obsessed with multitasking, ‘getting things done’, and the idea of ‘success’ essentially linked to how ‘busy’ we are, it’s no wonder we find it difficult to take one thing at a time and just breathe. Adding in extra little challenges to postures we’re familiar with offers us a chance to develop that one pointed and meditative focus our minds really need in order to find a little more stillness. Start in a seated position and take a gentle spinal twist to each side to prepare the body for deeper twisting. After this, make your way into adho mukha svanasana (downward facing dog) and walk forwards to tadasana (mountain pose). Practice a few rounds of surya namaskar a and b, using ashta chandrasana instead of virabhadrasana 1 in your surya namaskar b in order to practice and find comfort in the posture. Ashta Chandrasana offers a little more of a challenge in terms of balance, as the foundation is the balls of the feet. To make the posture feel more stable and to prevent any compression in the hips, make sure the feet are about hip-distance apart. After you’ve practiced a few rounds and the body feels warm, make your way into anjaneyasana (low lunge) and first practice the twist here. In the low lunge – with the [right] foot forward – wrap the arms around the body and twist to the right, bringing your gaze to the back heel. Notice if the breath becomes shallow or if you stop breathing all together – as maintaining a steady and even the breath keeps the nervous system calm and is way more important than ‘doing’ the asana. After practicing this to both sides of the body, make your way into adho mukha svanasana and prepare for the final posture. From downward facing dog, step the [right] foot forward between the hands. Set your foundation up first, as this will make the rest of the experience of the posture a lot more stable. (A good way to remember this is from a great saying by Daniel Scott: “foundation before decoration”. Essentially; find the posture before adding on any fancy stuff…. Make sure the feet are about hip-distance apart, and press both of the feet down and away into the mat before you come up. Lift the arms forward and up as the upper body raises into a high lunge. Find comfort here first, maintaining an even and steady breath. If you want to move towards the extra challenge of taking your drishti or ‘gaze point’ towards the back heel, then turn the head slowly and steadily to look back. Again, notice if the breath becomes strained, the muscles grip, the jaw clenches or the toes begin to grip – all of these are actions the body does when it’s in a state of stress, so it’s not something we want to bring onto the mat…. Soften what doesn’t need to be gripping and maintain a deep, slow breath. Stay here for 5-10 breaths, or for however long feels good to you. To transition out, bring your gaze back to the front, and unwrap the arms from around the body. Bring the hands down to the floor either side of the front foot and step back into downward facing dog before practicing to the other side of the body. 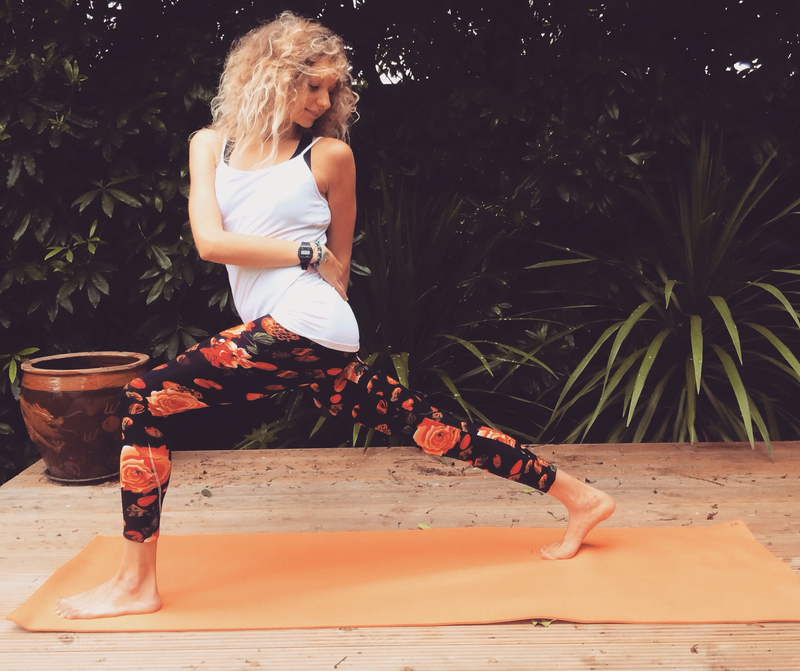 Adding in small challenges that help expand our boundaries rather than crash right through them helps to keep our physical yoga practice sustainable, and by cultivating eka grata, our practice comes closer to feeling like a moving meditation than a workout….